PUT YOUR CHICAGO WEBSITE AHEAD OF THE GAME WITH A VISION FORCE MARKETING WEBSITE DESIGN! As a Chicago, IL business owner, possessing a responsive - high-end website and digital marketing solution is essential to the success of your company. Vision Force Marketing® offers Chicago business owners unmatched online marketing, web designs, and website statistics. We are the premier website design and social media marketing company in Chicago as our SEO specialists are expertly trained, our digital marketers are masters in their field, our marketing strategists know exactly how to drive conversions, and our web designers have designed countless websites built to attract new customers. We can assist you if your website is an outdated, unresponsive webpage in need of a facelift, or if you require a fresh digital marketing campaign built specifically for your needs. 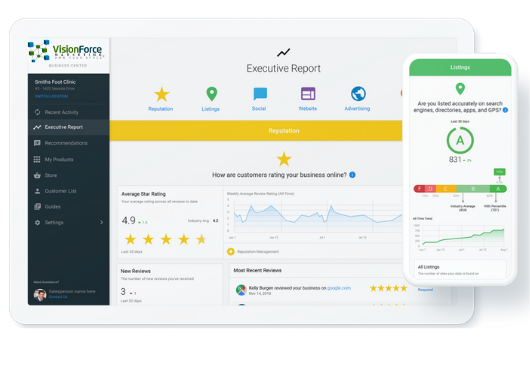 Receive your CUSTOM MARKETING REPORT below to see how your website compares to your competition. WE ARE THE #1 SOURCE FOR YOUR CHICAGO COMPANY'S WEB DESIGN NEEDS. Vision Force Marketing has been serving Chicago, as well as areas all over the world since we began. We have served hundreds of businesses in over 45 different industries on almost every continent and have the specialized knowledge to ensure that your company succeeds. We offer a renowned, award-winning marketing platform that provides measurable marketing and data results. We have successfully helped numerous business owners around Chicago, and have the marketing tools that make gaining exposure for your business simple and straightforward. We have spent more than 5 million dollars in researching and optimizing our digital marketing system, so you can smoothly run your business while we take care of your online web design and digital marketing needs. Contact us today for your free demo. Why Do We Tailor A Marketing Strategy To Your Business Before Building Your Website and Digital Marketing Plan? At Vision Force Marketing, we’re a different kind of web design company. We started as a digital marketing company in Chicago and saw business owners being taken advantage of. So, we founded our company based on what Chicago website client's said they needed most. Our Vision Force Marketing Strategy Formula™ includes suggestions on your specific business needs. A well-designed marketing map will help us build a website to include everything you need, while our digital marketing tools are designed to help you leverage your business. Our marketing plan will reveal the items you must have in order to run a successful online marketing campaign. To receive a new or revamped website design from Vision Force Marketing, simply contact us today. We will come to your office in Chicago, or you can call us to discuss your specialized needs for your website design. We examine all sorts of real data on your competitors, your current SEO ranking, online content and social media clout. The next step is quoting your-design or new website project. We gather a wealth of information from our initial meeting to build a recommended list of products, services and marketing strategies to help you convert potential visitors into paying customers, as conversions are what we care about most. Our custom marketing recommendations will be both a one-time setup cost, as well as an ongoing maintenance and retainer cost. We present everything like your custom marketing strategy, website design, hosting, SEO, content writing, photos, videos, database imports for email marketing campaigns, product shopping carts, or any other needs you may require to get your site up and running.